Life With a Whisk: Quite the pair. Here we are in Los Angeles, enjoying warm weather and blue skies with a little over a week until Thanksgiving. I was in New York just a couple weeks ago enjoying the biting breezes and investing in a earmuff-headband thing from Uniqlo because, well, it was necessary (and adorable), and it was beginning to feel a lot like Christmas. I was lucky enough to have missed the 90+ degree heat wave, but aside from some decorations up at the Grove, one would have no idea that the holidays are just around the corner. I purposely drive on Third Street through Hancock Park sometimes just to admire the turning leaves on trees lining the street of homes reminiscent of what I'd see in a romantic comedy set during the holidays. Sixth Street is an even better drive -- those colorful leaves even blow up and trail behind cars as you make the turns on the windy stretch. when I lived on the west side, my journey to work always included a segment on Barrington before it turned into McLaughlin, and it always felt like a suburban East Coast fall in those few moments. Thankfully, I also have desserts to bring about the warmth and fuzziness of the season, so this week's pick by the sisters (and sister-in-law) Celestial Confections was especially welcome. I've never actually baked anything with cranberry before, and only made cranberry sauce from the fresh berries for the first time last year, but there really is no better time than now to test out a recipe. A galette is a crostata is a free-form pie, so it comes with Dorie's buttery, flaky, amazingly delicious dough that I rave about time and time again. Just that would be enough (my co-worker could probably make a dinner with the crust cookies I make with the scraps), but the cranberry-ginger-lime filling has a brightness that makes you forget the gloom and doom of the season and rings in the holidays, too. 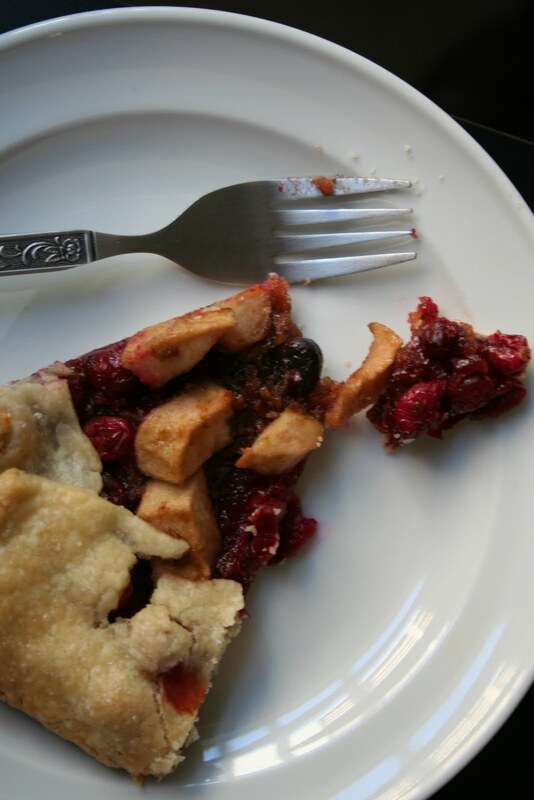 The cranberry could have been a fine filling to the galette by itself (albeit one-dimensional), but the addition of the ginger and lime zest/juice provided a kick that suddenly made the pastry more interesting. My one minor grip with the final product is that it expanded much more than I expected -- though I didn't keep it out of the fridge long before I sent it to the oven, perhaps a post-assembly chill or freeze would be good to maintain the cute, compact shape of the galette after it having been baked. 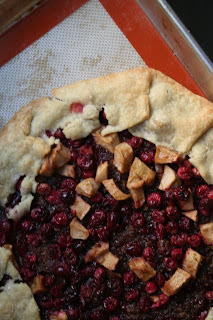 The galette was undoubtedly a rustic looking thing, but it was met with rave reviews all around. Cranberry and lime have been known to be good friends with vodka, but with a hint of ginger in a rich crust, I think I'll stick with bourbon and devour this instead. Certainly looks tasty. Love galettes for all the same reasons. Bourbon + galette... I think you're my kind of friend ;) What a beautiful rustic galette!